“Mud” is a tale of elemental things — falling in love, and putting your faith in others, and spending summer days with your best friend when you’re fourteen years old. It moves slowly, carefully, laying out the story it wants to tell with performances that feel very real, writing that’s authentic, and direction that knows exactly what to leave in and what to take out. It has the values and sense of freedom of ‘Huckleberry Finn’ and a bit of the seriousness of ‘To Kill a Mockingbird.’ It feels both a bit old fashioned and very contemporary; this is a movie that knows what it’s like to be young, to be poor and hopeful, and to be living on the river. It’s a movie to savor for its performances and to remember for its simple story well told. And yet, as I left the theatre, I kept asking myself: Was the whole really more – or less — less than the sum of its often-excellent parts? When one or two performances are good, I tend to credit the individual actors; when all the performances – as well as the writing – are uniformly excellent as they are here, the Director clearly had a strong hand in those also. 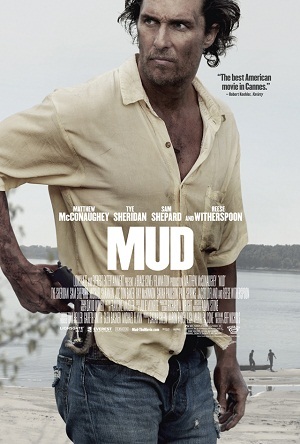 In ‘Mud,’ writer-director Jeff Nichols shows real talent; he’s created a story of real people who trust their instincts and follow their heart — and while life often drives their dreams into the muck, they somehow always find hope for the future.